3 Team Collaborations for the History Books. When it comes to collaboration, musicians know how to do it right. Who can forget the music and comedy of Sonny and Cher, the touching country ballads of Dolly Pardon and Kenny Rogers, or the emotional, poetic performances by Eminem and Rihanna. 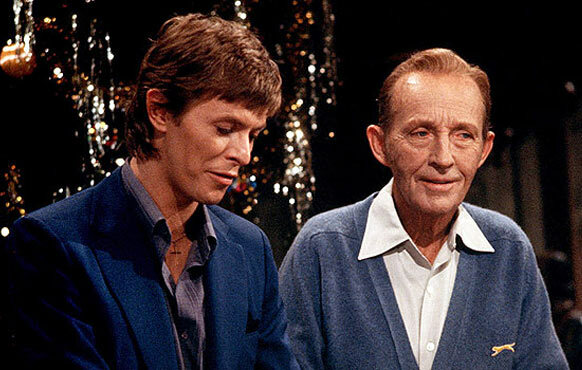 But one of the most mind-boggling, unexpected duets ever came from none other than David Bowie and Bing Crosby. Yes, that Bing Crosby. For viewers, it was a surreal television experience in 1977 when Bowie, having emerged from his Ziggy Stardust and Thin White Duke years, walked onto the set of Crosby’s Christmas TV special. He wore an ordinary blue sport coat, exchanged casual and even engaging dialogue, and then crooned with one of America’s national treasures, Mr. “White Christmas,” himself. Wait, what? But this “Peace on Earth/Little Drummer Boy” duet worked, taking fans and skeptics by surprise. Years later, the recording topped annual Christmas music charts, and Bowie would go on to collaborate with other unlikely artists like Freddie Mercury, Mick Jagger and Alicia Keys, just to name a few. Unexpected pairings can be risky. But when successfully, they can bring surprising, powerful and long-lasting results. Again … wow. Looking for a good laugh?! This famous collaboration has a great parody on the Peace on Earth/Little Drummer Boy duo with Will Ferrell & John C. Reilly. Right place, right time. Team Collaboration by Design. When Steve Jobs worked with architects to design Pixar’s headquarters in Emeryville, Calif., he had a clear vision: an atrium would be featured in the middle of the building, right next to the bathrooms. It sounded like a simple request, but really, it was a brilliant business strategy. What was the point? Well, if employees from all different departments had to converge in one area throughout the day for sheer necessity, it would serve as a natural co-mingling of brain power. Engineers would regularly cross paths with graphic designers, and accountants with marketing executives – the perfect petri dish for collaboration. Although ultimately the building had to include more than one location for bathrooms, the atrium also strategically housed employee mailboxes, meeting space and a cafeteria. The design promoted unplanned conversations and spontaneous brainstorming sessions. This emphasis on teamwork, and the linking of ideas together, would help elevate Pixar from a struggling computer manufacturer to the movie-making giant we know today. Wow. Unlikely Teamwork. Finding Common Ground. Politicians can be described with lots of adjectives, and rarely are they positive. But former Presidents George W.H. Bush and Bill Clinton surprised even themselves after joining forces for a good cause. The former rivals teamed up for a number of initiatives, but it was after leading relief efforts for victims of the 2004 Indian Ocean earthquake, and then later for Hurricane Katrina, that their unlikely teamwork got noticed. They were jointly awarded the prestigious 2006 Philadelphia Liberty Medal for their work. The two continue a strong friendship to this day, and Clinton has even referred to himself jokingly as the, “… black sheep son of the Bush family.” A perfect example of unity, the former Presidents prove that when people bring their combined influence, talents and experience together for one common goal, the results can literally be life-changing. Collaboration can lead to great things, and when given the right tools, environment and opportunity, otherwise ordinary efforts can become extraordinary. They can become something bigger than we ever imagined – a kind of knock-your-socks-off, slap-in-the-face … wow!